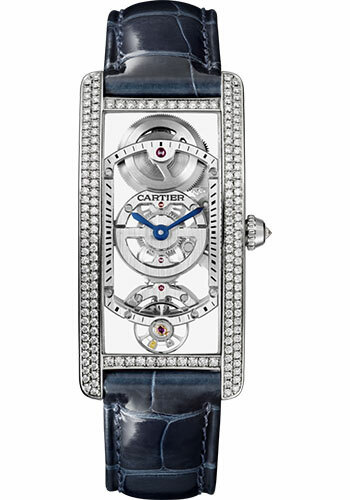 platinum case set with 168 brilliant-cut diamonds (~0.90 carats), sapphire back, beaded crown set with a brilliant-cut diamond (~0.10 carats), mineral crystal, skeleton dial with blued-steel sword-shaped hands, caliber 9917 MC manual winding movement, approximately 60 hours of power reserve, black alligator strap, platinum double adjustable folding buckle. 46.3mm x 23mm platinum case, 7.2mm thick, beaded crown set with a ruby cabochon, mineral crystal, gray dial with blackened-steel sword shaped hands, caliber 8971 MC manual winding movement, semi-matte gray alligator strap, platinum ardillon buckle. Water resistant to 30 meters. platinum case, 8mm thick, sapphire back, beaded crown with a sapphire cabochon, mineral crystal, white dial with hours and minutes and skeletonized curved movement following the shape of the case, caliber 9917 MC manual movement skeletonized and curved movement following the shape of the case, the barrel and the balance are inclined so they can follow the shape of the movement, approximately 60 hours of power reserve, black alligator skin strap, 18K white gold double adjustable folding buckle. Water resistant to 30 meters.